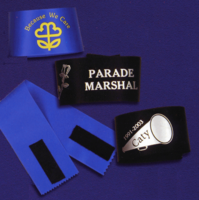 Find award ribbons in a large variety of styles. Choose from our stock printed or participation ribbons. They ship in just 1-2 days and many times the same day! Or select our custom ribbons and add your own text and logo. Be sure to also see our popular badge ribbons and awareness ribbons. Award ribbon orders over $100 ship free! Add your own wording and artwork to the ribbon awards in this section. 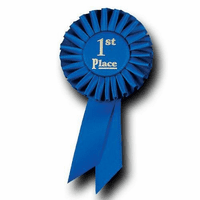 A great selection of 1st -10th place ribbons and other printed ribbons in popular titles. Popular rosettes - streamer, mini, 1st place blue and more! TrophyCentral has a huge selection of discounted ribbon awards to meet all of your needs. From Prize Ribbons to Place Ribbons to Blue Ribbons, we have it all. Printed designer ribbons ship in just 1-2 days. We can also print Custom Award Ribbons with your own personalized wording and artwork. We stock a full range of badge ribbons in a variety of colors for conference and events. We also have badge holders and even lanyards that can be imprinted!